When his son's arm was amputated at just 10 days old, Ben Ryan set out on a personal mission to provide him with the best possible start to life and reduce the chances of prosthetic rejection. As a psychology teacher he began with no engineering experience but has since embarked on an incredible journey, using 3D printing to change the life of not just his first-born child Sol, but also many other children around the world. Sol is my first child, he is the light of my life. We had a completely normal pregnancy, but Sol decided to come into the world in an awkward position, and due to forceps crushing the artery in his left arm, he developed a particular kind of blood clot. There are about 2 hours before the limb starts to die and sadly he didn’t stand a chance of keeping his left hand. By the time we reached a specialist unit in Alderhay it was too late and he had to lose the arm. I remember feeling like I was in a dream, but after the amputation the nurse came in to the room and told us that Sol’s blood type was B positive, and I took that as a sign. It made me want to start focusing on what I could do to help my son, rather than focusing on the things that he wouldn’t be able to do. It was time for me to “B positive”, so I started researching in the hospital on my phone about amputees and prosthetics. When he came home after 5 weeks, his left arm was no longer moving at all. That wasn’t good enough for my son, so I decided to start doing something myself. I rushed into the kitchen, took a kitchen sponge, created a makeshift forearm and just tacked it onto his arm lightly, and literally within ten seconds he lifted it up and starting banging his toys. From that day onwards Sol was using both arms and my heart just lifted. I had no background in engineering and if someone had told me 2 years ago that I would have been an engineer by profession, I would have just looked at them and told them that they were mad. But I knew that I had to help my son. There has never been a better time to become an engineer. If you have an idea and the motivation to do it then you can do it and you can change the world. The biggest challenge facing Sol was to be able to accept a grabbing artificial arm when it would eventually be given to him by the NHS aged 3. I had seen lots of stuff about children rejecting prosthetics, because 3 years old is too late and they had learned to cope without. That just spurred me on try and do something myself. 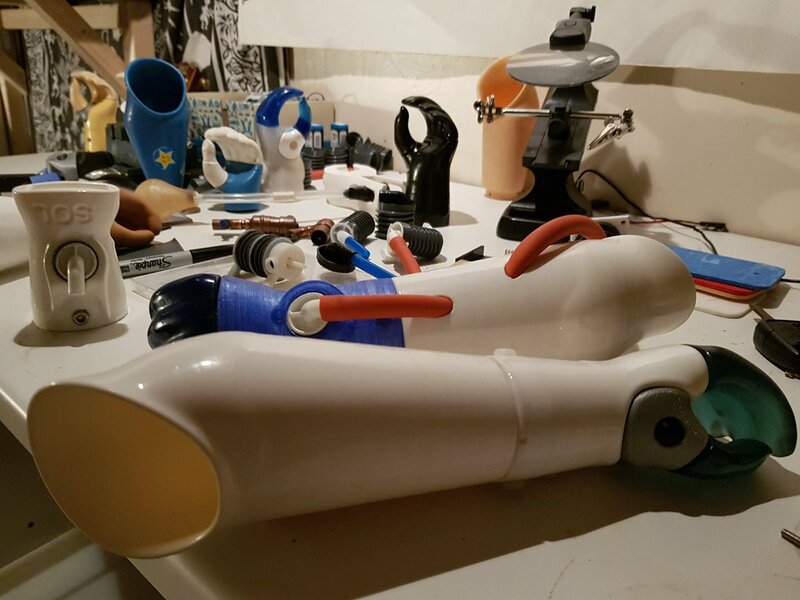 I started making prototypes with off the shelf components; washers and a screwdriver handle, gluing pieces of plastic and tubes together, until I realised that the cheapest way of doing all of this was through 3D Printing. I remember one night lying in bed at 2am watching a spider and thinking that they use hydraulic pressure to actuate their legs, maybe I could do the same. A fluid solution jumped to mind, kind of like a eureka moment. I knew that Sol was capable of squishing a bag of fluid, so I proceeded to use this to create hydraulics with a moveable thumb. I then came to Bangor university for help as I had to find a way of generating a socket that would completely fit around the stump of the arm. Somebody mentioned that the XBox Kinect had a scanning function, so I waited for Sol to fall asleep, Kate held his arm steady and within 5 minutes I had an exact scan. This then enabled me to create a bespoke socket fitting. Once this is was complete and the arm was the right size I took it into Sol’s room and he slid it onto his stump and he actually said the words “it fits properly”. He was so excited and just wanted to go to school and show it off to all of his friends. That’s when I knew I’d done it right. Whenever I see Sol using his passive, non functional arm intuitively to do things like lean down and scratch his leg with it, it makes me feel like even if it all stops now I think I’ve managed to bridge that gap. I want to show the world that this isn’t just something that I have been working on with my son and I could easily help other children. While I’ve been worrying about the lack of support in the UK that children like Sol have had, it pales in comparison to what’s available in the likes of South America where children aren’t given any prosthetics until they’re in their teens. I wanted to slash the costs and reduce the time it takes to make these things. Nothing like this has ever been done before. I decided to do trial home scanning where parents around the world use the XBox Kinect scanner and send me their child’s scan, so that I can create a test socket and send it out to them to see if it fits snugly. Then I can create the entire prosthetic arm for them affordably. It currently takes me between 20 and 40 minutes to create a socket, having worked with over 20 families around the world so far. I’m getting faster and getting better. I want to keep affordable arms available to families around the world who don’t have access to a prosthetist. My goal is to be able to set up an Ambionics on every continent. I think that this is the shape of the future. Since Sol has been able to talk, he’s been able to say RS Components. I’m eternally grateful to RS. I didn’t realise just how expensive 3D Printer filament could be. They provided enough for me to not only carry out my BETA trial, but also most of my prototyping. It was really motivating for me.